Tom Powers (James Cagney) is a bad seed, and has been his entire life, from his early days hanging around pool halls with petty crook Putty Nose (Murray Kinnell) to running booze for Paddy Ryan (Robert O’Connor) during prohibition. With the help of his longtime pal, Matt Doyle (Edward Woods), Tom quickly moves up the ranks in organized crime, rising all the way to the top. His mother (Beryl Mercer) believes her son is a good boy, while older brother Mike (Donald Cook) knows the truth about Tom’s ‘business’. Mike tries to convince his brother to go straight and end his criminal ways, but will a rival gang get to Tom first, thus bringing his reign of violence to a bloody end? In an amazing characterization, James Cagney brings a truckload of style to the role of Tom Powers. With a squint of his eye, a tip of his cap, and a soft punch from his right hand that’s nothing more than his way of saying “hello”, Tom Powers is the very definition of charisma. An unsavory, sometimes violent individual, he's a man we're supposed to abhor, but because of Cagney’s cool, effortless portrayal, we don’t. In fact, from where we're sitting, Tom's life looks pretty darn good. In one scene, he's treating his newest girl, Gwen Allen (Jean Harlow), to a night on the town. They walk into a restaurant, where the Maitre d acts as if Tom were a member of the Royal Family, seating the two of them at the best table in the house. As if this attractive portrayal of the criminal element wasn’t enough to get the censors screaming “foul”, the gangsters who inhabit the world of The Public Enemy take it a step further, daring to revel in their decadence. Tom is bad; and doesn’t give a damn who knows it. When his brother, Mike, who’s just returned from service in World War One, confronts Tom about the life he’s chosen, Tom simply smirks and walks away. Nobody can prevent Tom Powers from doing exactly what he wants, and the way James Cagney plays him, we pity whoever tries to. Challenging Hollywood’s unwritten rule that movies must show good triumphing over evil at every turn, The Public Enemy dared to depict a gangster as a somewhat sympathetic character. But they never could have pulled it off without James Cagney. 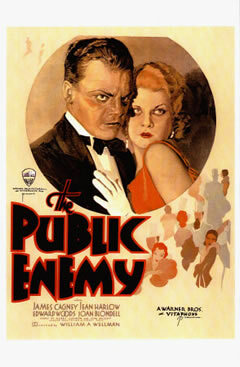 The Public Enemy has been called the film that made James Cagney a star, yet I don’t think this is completely accurate. James Cagney was a natural performer, a man destined for greatness at some point in his career. It was The Public Enemy that truly benefited from the pairing.